While in D.C. last month, I visited the National Museum of the American Indian for the first time. I’ve been wanting to visit since it opened, so I was delighted to have a couple of hours free one afternoon. As this picture from the National Geographic website illustrates, the NMAI is a beautiful building, and just as its outside is quite different from the other museums in the Smithsonian, so too is its inside. It has a much more fluid, organic organization than more traditional art museums. For example, exhibits are arranged by theme rather than historically. It also embraces a multimedia approach to its subjects, often blending sights, sounds, video, and music into an organic whole that represents native tribes, their artifacts, their art, and their beliefs holistically. Most of my museum blogging has been about art museums. I’ve also written a couple of posts about natural history museums. This is the first cultural museum I’ve visited in a while, and it took me a little while to get acclimated to it — visiting this kind of museum is obviously very different from looking at paintings, sculpture, etc. Visitors are encouraged to start on the top floor and work their way down. The first exhibits I saw were in the Our Universe exhibit. Our Universes focuses on indigenous cosmologies–worldviews and philosophies related to the creation and order of the universe–and the spiritual relationship between humankind and the natural world. Organized around the solar year, the exhibition introduces visitors to indigenous peoples from across the Western Hemisphere who continue to express the wisdom of their ancestors in celebration, language, art, spirituality, and daily life. Once I got my head settled and knew what I was looking at, I fell in love with this museum. The second exhibit, called Our Peoples, was excellent. As the website explains, by having native tribes tell their own histories in their own ways, “the exhibition presents new insights into, and different perspectives on, history.” These native perspectives are placed beside exhibits on weaponry and the conversion of native peoples to Christianity. Having visited some of the missions in Texas, I found the latter particularly interesting. One floor down is the Our Lives exhibit, which explains “how residents of eight Native communities–the Campo Band of Kumeyaay Indians (California, USA), the urban Indian community of Chicago (Illinois, USA), Yakama Nation (Washington State, USA), Igloolik (Nunavut, Canada), Kahnawake (Quebec, Canada), Saint-Laurent Metis (Manitoba, Canada), Kalinago (Carib Territory, Dominica), and the Pamunkey Tribe (Virginia, USA) — live in the 21st century.” This was my favorite of the cultural galleries. I enjoyed how each tribe was allowed to present their culture as they saw fit, meaning that some of them emphasized customs and beliefs, while others emphasized their music or their crafts. The third floor also houses the W. Richard West, Jr. Contemporary Arts Gallery. I don’t know much about native artists, so I learned a lot by visiting this gallery — I’d love to learn more about some of the artists I saw. This image doesn’t quite capture the beauty of this work — especially its vibrancy. 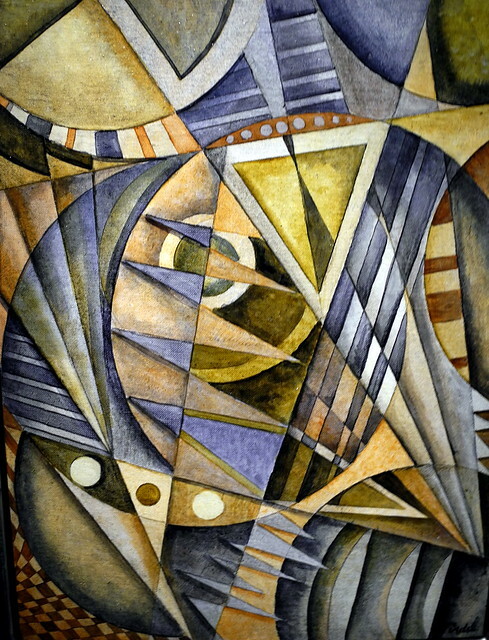 If you click on the image, the link will take you to the museum’s site about this work. Their picture is much better, and you can zoom in to see it in a little more detail. This review discusses this painting better than I can, so I highly recommend reading it. This painting also struck me because of its vibrancy. In person, it almost seems in motion. It’s a kaleidoscope of color. 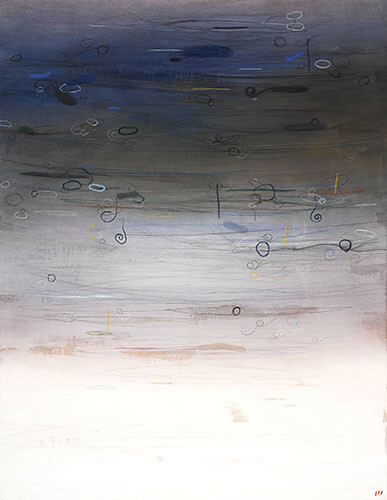 In contrast to the previous two works, I love this painting’s muted color palette. It’s kind of simple in its organization and representation, but it’s also very realistic in its representational quality. I would love to have this work — or a high quality print — hanging in my house! 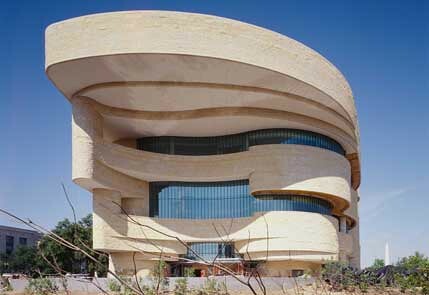 The National Museum of the American Indian is a museum that I will want to visit again the next time I’m in D.C. I want to spend more time in the first three galleries, taking in their multimedia content more effectively. The failure to do so this time is entirely my own. This is a museum that can teach us a lot, and I definitely want to learn! One Response to Visiting the National Museum of the American Indian in Washington D.C.